South Korea's presidential office Cheong Wa Dae welcomed North Korean leader Kim Jong-un's ongoing trip to Beijing on Tuesday, saying the North Korea-China summit may help efforts to denuclearize the Korean Peninsula and establish lasting peace. "We hope the exchange between China and North Korea will contribute to the complete denuclearization of the Korean Peninsula and establishment of lasting peace," Cheong Wa Dae spokesman Kim Eui-kyeom told a daily press briefing. 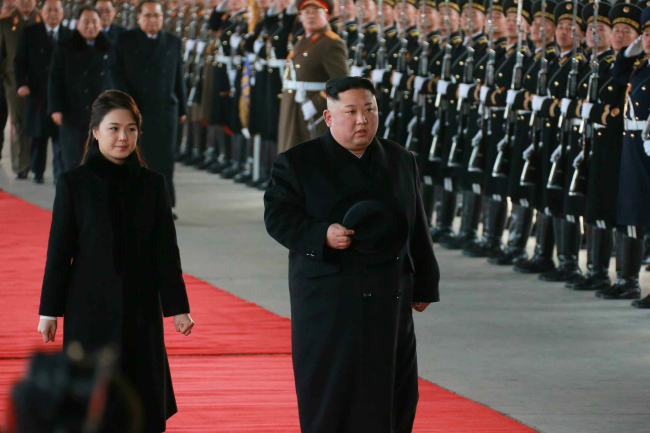 The remarks followed reports that Kim arrived in the Chinese capital earlier in the day for a bilateral summit with Chinese President Xi Jinping. The Cheong Wa Dae spokesman said the Seoul government was informed in advance by both Pyongyang and Beijing of Kim's trip to China. "We were contacted by both countries and have been sharing our information," he said. The spokesman expressed hope that the China-North Korea summit will also lead to a second US-North Korea summit. "Exchanges are underway between the two Koreas; North Korea and China; and North Korea and the United States, and we hope there will be a virtuous circle of these exchanges so progress in each exchange will lead to progress in others," he said. US President Donald Trump has agreed to meet the North Korean leader for their second-ever bilateral summit, but the time and venue of their meeting have yet to be set.